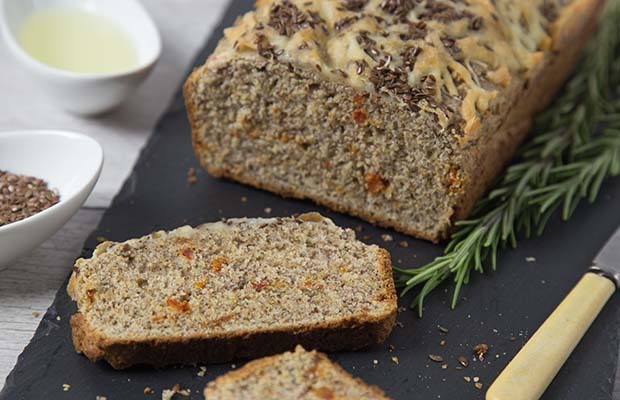 Make this delicious loaf of savory sundried tomato herb bread for brunch or dinner. Place the sundried tomatoes into small bowl and cover with boiling water. Let stand for 10 minutes then drain and chop. Preheat the oven to 350 °F (180 °C). Lightly grease a loaf pan and line it with parchment paper. In a large bowl, combine sundried tomatoes, flour, flaxseed, whole wheat flour, Parmesan cheese, sugar, baking powder, herbs, salt and pepper, stir well. In a medium bowl, whisk together the milk, oil and egg. Pour into the dry ingredients and stir just until combined. Scrape into the loaf pan. Bake for 30 minutes then carefully sprinkle the cheese and flaxseed on top. Bake for another 10-15 minutes, until the cheese is melted and browned, and a toothpick comes out clean when inserted into the middle. Remove from the oven and let cool in the pan on a wire rack for 10 minutes. Remove from the pan, remove the parchment and let cool completely before slicing. Serving Size: 1 slice. Each piece contains 1 Tbsp (15 mL) ground flax.